When you come to Tonga and swim with the whales you are spending your tourist dollar in a way that helps make an economic impact to an island communitie in sustainable way. 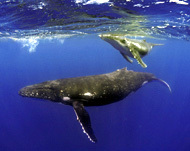 This link is to a graphic photo display of a whale harvest in Denmark currently under day. Warning- These images are not for the faint of heart.